A 43-year-old Reginald D. White of Bradenton stopped on Interstate 275 after a tyre blew out on his SUV. 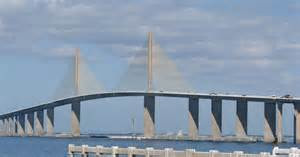 He got out of his vehicle following a blow out, stumbled backward after he had changed the said tyre and fell some 30 feet off the Skyway bridge. White lost his balance and fell backward, over a barrier wall and into the water below. An incident report says officers from the Florida Fish and Wildlife Conservation Commission rescued White, who was taken to Bayfront Medical Center in St. Petersburg with minor injuries. Two passengers in the SUV were not injured. The highway patrol is investigating the crash.